The filter described below replaces any "(not provided)" data with "np - [landing page title]" - this at least lets you know which pages on your site are receiving search traffic. Here's a BEFORE and AFTER example of what the filter does. Search term reporting BEFORE applying the filter. This data is from 2013. As you can see above, all I know is that 130 search visits came from Google but I have no clue as to what content was attracting search visits. The other terms listed are Yahoo and Bing search terms. Search term reporting AFTER the filter has been applied. Now we can see which pages are attracting organic search visits. As you can see, the (no provided) numbers have been split by landing page, so at least I have an idea of which content is performing well in Google search - I can also use this to perform SEO activities on individual pages and track whether the proportion of traffic those pages attract changes as a consequence of the activity. 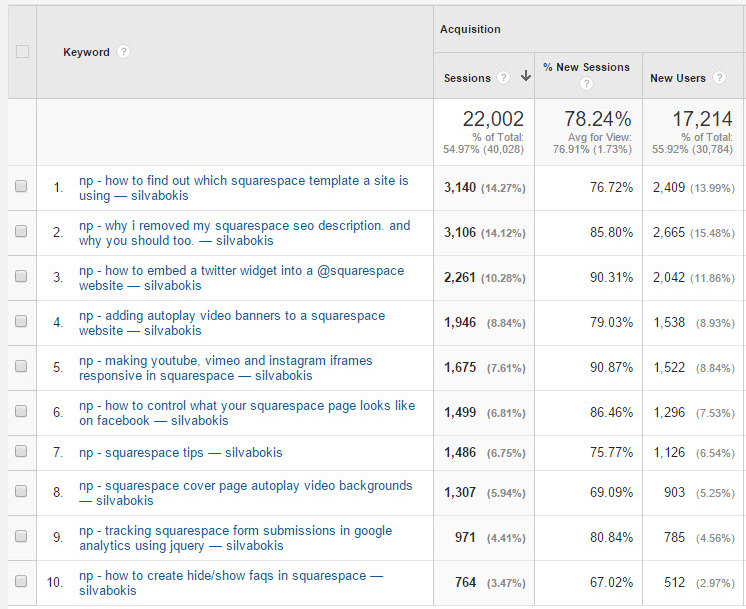 In Google Analytics go to Admin for your site's reporting and click on Filters in the right hand View column. Now Add Filter and copy the information in the graphic below into the form before Saving the filter. Once applied, the filter will enhance (not provided) referral data from that moment onwards.